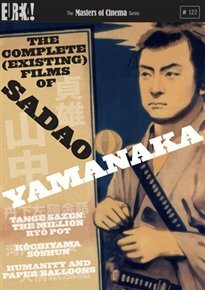 The brief but prodigious career of Japanese director Sadao Yamanaka resulted in a catalogue of work characterised by an elegant and unforced visual style, fluid editing, and a beautiful attention to naturalistic performances. Although he made 22 films over a six-year period (before dying on the frontline of WWII aged 29), only three of them survive, collected here for the first time in the West. Tange Sazen: The Million Ryô Pot is a gloriously comic adventure yarn as the titular one-eyed, one-armed swordsman becomes embroiled in the hunt for a missing pot that points the way to hidden treasure. In Kôchiyama Sôshun, a subversively humanistic adaptation of a classic kabuki play, a small but invaluable knife stolen from a samurai leads to a chain of an increasingly complex and troublesome set of circumstances. His last film, Humanity and Paper Balloons, is an unsparing ensemble drama set among the lowest rungs of Japanese society in the 18th century. The Masters of Cinema Series is delighted to present these treasures of world cinema in a long-awaited two-disc DVD set, including rarely-seen fragments of two other lost Yamanaka films.